After years of planning and preparation, construction of an entirely new terminal in the outer area of the Port of Gothenburg has started. 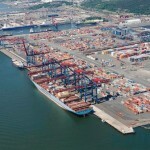 The project will be the largest expansion undertaking at the Port of Gothenburg in 40 years. Phase 1 started with piling earlier in the week. The 220,000 square metre terminal will be constructed using dredge spoils contained by an embankment, and is scheduled for completion around 2025. 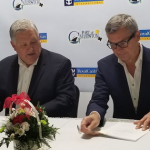 “It feels very exciting indeed that we can finally break ground in the biggest development project at the port since the 1970s. 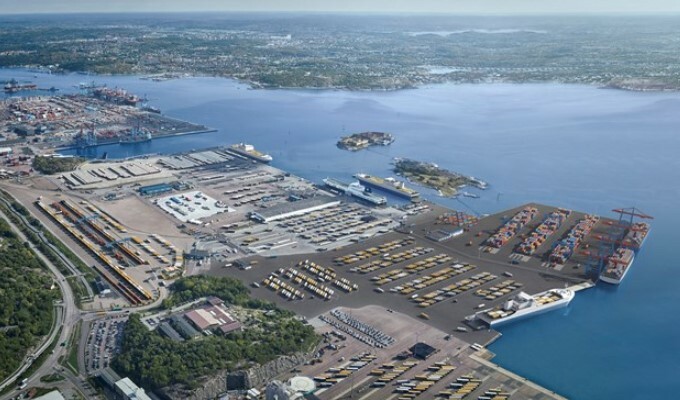 The terminal is a vital part of the long-term expansion plans at the port, and it will reinforce Gothenburg even further as the logistics capital of the Nordic region,” said Magnus Kårestedt, Gothenburg Port Authority chief executive. The terminal, which will cover an area of 220,000 square metres, will be built using 350,000 cubic metres of dredge spoils from the river, the Göta Älv. The spoils derive from routine dredging carried out to maintain the water depth. Both the dredge spoils and the river are contaminated with various substances, including TBT, tributyltin. Up until 2008, TBT was an antibiocide component in antifouling paints used for the hulls of ships and boats before research showed that it was toxic to the marine environment. “There is no suitable landfill site for contaminated spoil volumes of this magnitude. 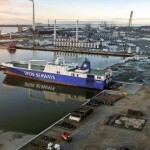 This is an excellent way of using the contaminated spoils and at the same time helping to clean up the river,” explained Eduardo Epifanio, project manager at the Gothenburg Port Authority. The spoils are placed in an embanked area in the Arendal Bay and cement and slag are used as binding agents. To ensure the spoils can be enclosed safely without them seeping into the surroundings, a series of comprehensive field trials have been conducted, both in a laboratory setting and in a small test basin in Arendal Bay. Following successful trials, the construction of the terminal is now ready to commence. An embanked area will be created at Arendal Bay, which will then be filled with materials. Before this can be done, the bed within the blasted rock embankment needs to be stabilised with the aid of piles. Stage I involves piling from the seabed down to the rock, under the envisaged embanked area. The embankment will be built using blasted rock and sand. “The first piles are about to be put into place and this will continue through to the end of the year. Around 1,500 piles will need to be in place before we can enter the next phase, which will involve building embankments from blasted rock above the piling. The terminal will be completed in 2025, although it is anticipated that certain sections can be brought into operation before then. Where? On the Hisingen side of the Göta Älv estuary, between the Älvsborg Harbour and the Arendal Harbour. When? Piling and blasting has commenced. The terminal will be completed in 2025. How? Built using dredge spoils placed in an embanked area in the Arendal Bay. Why? 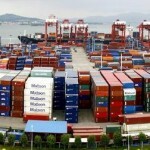 To handle the long-term growth in freight volumes.